Holsters : To ensure a perfect gun-to-holster fit, I block and hand-bone every holster to the weapon it is designed to carry. This is my personal guarantee! 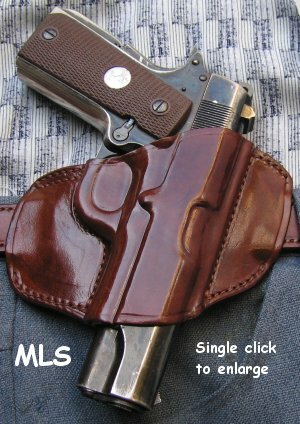 Holster Model ML, MLS: Don't let the minimal aspect of this holster fool you one little bit. It's one of the finest belt slide holsters available on the market today, incorporating more positive design features than any other comparable holster of its type. As with all Horseshoe holsters, detailed blocking and hand molding ensure positive weapon retention (see enlarged image). Wide-spaced tunnel loops provide a clean, flat profile and allow for positive positioning of the holster over a belt-loop, while pulling the weapon close into the body for optimum concealment. A moulded sight track combined with a slight muzzle rear rake allow for an easy strong side draw. This simple yet superlative holster is hard to beat for lightness, speed, security, concealment and comfort. 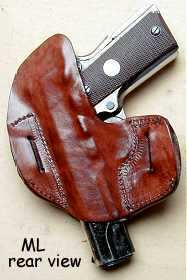 The rear protective tab option is available (S in holster model designation denotes NO protective tab). 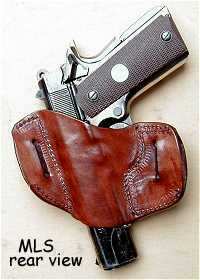 Check the availibility of this holster for your weapon by consulting the Holster Selector Chart. Available for belt widths of 1 1/4" or 1 1/2" only in Saddle Tan, Cordovan, or Black (Click here for colour samples). NOT AVAILABLE IN LEFT-HAND CONFIGURATION. A word of caution: the ML/MLS would not, in my opinion, be suitable for the Glock, Sigma, Springfield XD, etc. range of pistols, or any other pistol in the wide-bodied category. Their extreme width may cause the holster to partially close up on itself when these weapons are drawn, making one-handed re-holstering a bit of a problem. To see an action demonstration of model MLS, ensure your browser is Java-enabled, wait until this page has fully loaded ("Document Done" or "Done" in Status Bar) then Click this link.